Have you been plagued with boils, cysts, ingrown hairs, and acne-like bumps that take months to resolve, leave embarrassing scars, and cause considerable pain? 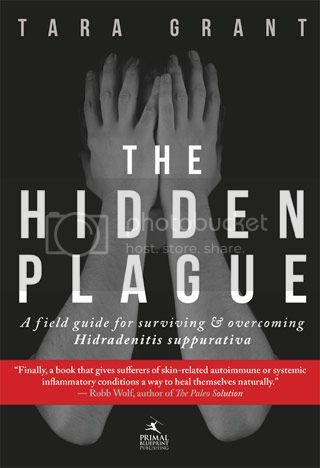 Have you been to the doctor, only to leave with a prescription for antibiotics, few answers, and little to no hope?Hidradenitis supprativa (HS) is a poorly understood skin condition that is believed to affect nearly twelve million people in the United States alone. Only a small fraction of those affected have been properly diagnosed, leaving many others to suffer in silence or pursue ill-advised conventional treatment methods that fail to address the cause of this painful condition. Read Tara’s guest article on Mark’s Daily Apple: Are Your Skin Problems an Autoimmune Issue? I am greatly relieved to know that there is a way out from this horrific condition.I have been suffering from this for the last 6-7 years.It was the same response which I too got from most of the doctors whom I visited except one Ayurvedic Surgeon who told me that the name of this disease is HS,though he was unable to prescribe me any proper medication for it.Thanks for sharing Tara……….May God help you……………….. I can’t wait to read your book. Thank you for your research, and sharing what you have learned. Any news on the release of the Kindle Version? It’s not available in the store yet. I’m really looking forward to this book! The Kindle version had some initial technical problems, but it should be available in the next couple days if everything goes smoothly. Stay tuned and thanks for your interest! It is now available on Kindle! Not seeing Kindle version on Amazon? ETA? So excited that there will be a Kindle version! Can’t wait! Thank you Mark (and Tara, of course)! Tara, just discovered you to from a reference from a H.S. facebook page. Been suffering from this for almost 25 years. None of my doctors could diagnose it, but finally figured it out after googling the symptoms last year. Finally a name! I will soooo get this book. Will it be available for Kindle? I have been waiting for this book to come out since I first heard about it!! Anxiously waiting and hoping this might be what I’ve been looking for for years!! I can’t WAIT for this book. Thank you for posting, writing and raising awareness. I have been suffering from this disease for 35+ years. It can be so delibitating and painful. Have had surgery once – horrid and no positive outcome at all, numerous visits to doctors – more antibiotics and tried various diets. I go into remission for short periods – 1-3 months, then another flare-up occurs and on it goes for 3-10 months again, before maybe calming down. I had all but given up until today after having a terrible painful week of new eruptions have headed to Google again to search out somthing new and came across Tara’s blog. Thank you! I am blown-away the the numbers of people sharing their stories. I don’t feel quite so ashamed and will be trying the Paleo diet recommeded. You know it’s been a week of potatoes, curry and tomatoes – maybe that is the trigger for me. Thank you so much Tara – my diet is set to change – maybe I’ll loose some weight too?! When will The Hidden Plague be released? We’re waiting – not so patiently. I cannot wait for this book to come out! I’ve been suffering with HS since puberty, dealt with untrained doctors who told me to shower more (?!?!) and it wasn’t until I clean up my diet a year ago that I finally started to get some relief. I’ve read your blog, and the heartbreaking comments related to your HS posts in particular, and I am so very eager to read more! Would love a copy of your book, when will it be available? I’ve had HS for quite some time now but had no idea what it was until I stumbled across your blog (thank fu$#)! I’ve cut out dairy and most gluten and have noticed a massive improvement (until easter chocolate eggs and milk to wash it down) so am suffering the consequences now! I do think though, that I need to ninja kick nightshades too but need some guidance, hence am keen on purchasing your book! Another massive problem I face is convincing family that a primal way of living is the most logical way to live….they’re starting to talk! (she’s like in a cult or something) haha! So yeah, looking forward to your book. I have also suffered with HS for 20 years like the author. I have already been on a Paleo diet for 3 years now and have seen great improvements. I can’t thank Tara Grant enough for her insightful blog about HS, which led me to the autoimmune connection and to nightshades. Since I still get occasional flareups of my HS (having one right now), I have more digging to do. Could be something hidden in the food I recently ate at a restaurant, hard to say since it was filet mignon. Can’t wait to read this book and learn more. It helps to know that there are others out there because this really is a hidden disease, no one talks about it so how would you know that others have it? With HS, you feel disfigured sometimes, and ashamed, even though no one can see your lesions. I remember awful times when I’d have huge eruptions of HS and could barely walk, so much pain. I tried to wear clothes that were a little looser to make it less painful but still had to go to school and work like that and would sometimes walk funny, too. CANT WAIT CANT WAIT UNTILL IM ABLE TO GET MY HABDS ON THIS BOOK . Wow! I cant believe that there is possibly a solution for my HS. I’ve suffered since my early teens and after hundreds of painful days and nights, tears from hiding my arms because sleeveless items reveal ugly scars, and considering surgery (that is painful and doesn’t actually fix anything) I’d given up hope that it would ever go away. Although change is scary and Lord knows I’m addicted to bread and sugar I am excited to read this book and make the necessary changes to save my life and change my body forever. Tara, may God bless you for sharing this with the world. No one ever talks about this disease…not even me…thank you for sharing, thank you! By reading your story last year whilst being off work watching the Olympics has helped me realise that my daughters have HS. The culprit the causes it (like yourself) is potatoes also. I have 2 daughters 21 (which seems to erupt between her thighs) and an 18 year (which seems to erupt under her arm pit) I’d like to thank you very much for your story because it has helped my daughter in controlling this disease. You also look stunning by the way!! We’d love to win your book! !